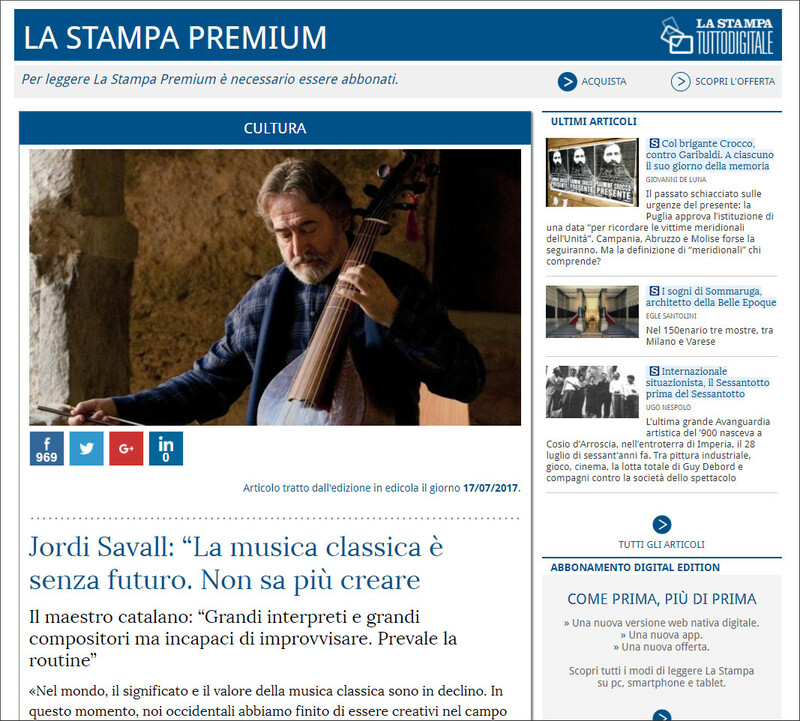 This interview with Jordi Savall in La Stampa Cultura has been causing something of a furore. Forgive me if I don't have the story quite right, but the article is in Catalan and behind a paywall. But it appears Jordi's harsh comments about the state of Western classical music - formulaic, self-serving and lacking creativity - have been greeted with social media ripostes from within Spain that people in glass houses should not throw stones. Readers will know that over the years I have been one of Jordi's biggest fans, so it saddens me to say that I have sympathy for some of the views expressed by his critics. In recent years I have been uncomfortable with certain aspects of Jordi's work. For instance, his puzzling criticism of the Spanish government's arts policy when he was taken funding from the ethically compromised Abu Dhabi regime, the difficulty of reconciling his humanitarian stance with his concerts in China, and the lacklustre book and CD projects which have repeated the same formula too often and sometimes are patched together from concert recordings made at different venues with varying acoustics. Then there are those audible mastering glitches in the SACD layer of his War & Peace CDs which are still uncorrected, and the unacceptable level of ambient noise and compromised sound on his recently released concert recording of Libre Vermell de Montserrat which is generally inferior to his 1979 EMI Reflexe account. I treasure many of Jordi's CDs, have wonderful memories from his concerts and look forward to his future successes. But there is no smoke without a fire, and I respectfully suggest that he spends a little more time reflecting on the criticism sparked by his interview, and a little less time mimicking other celebrity musicians by flying around the world telephoning in his performances, churning out boilerplate new releases and making Barenboim-like pronouncements about the sad state of the world. Of course a musician must earn a living. But at the age of 76 I believe it is time for Jordi Savall to find a little more of the inner peace that he has so persuasively advocated. Clarification and comment from my Catalan readers would be appreciated. The interview you link can now be read for free, for it's already 7 days since it was first published and thus has become open content, no longer premium. Besides, La Stampa is not a Catalan newspaper, it's in fact Italian. If you have any knowledge of catalan it will help you read it indeed, but not to a great extent. If it's actually the case, I'm afraid I'm unable to understand it. It comes as small talk to me. As for the latest Alia Vox releases, well... at least as far as their packaging and presentation is concerned, I could never understand why they raised such a great admiration in the first place. Superficially beautiful as they are, they also display many unpleasant features: tipography (I think most designers will disapprove of their pervasive usage of Times New Roman, which often appears with altered proportions or even bold! ), dull and uninteresting coloured backgrounds (plain white does much better), ugly pixelized pictures, goofy sentences in the guise of humanist declarations ("Without Emotion there is no Memory, without Memory there is no Justice, without Justice there is no Civilization, without Civilization human beings have no future"), or filler material just for the sake of it (should somebody really be interested in reading Luther's 95 thesis, there are plenty of sources to get them). I remember a brief talk of him before a nice viol concert. He said we should not forget that that music, however beautiful, was reserved to a few rich and powerful, and was itself the product of the dominance of just a Few over the Many. Something that can be said of most of Alia Vox'catalogue, I guess. So it's contradictions all the way up, or down. For him and for everybody. And it will be the way we confront them, or come to terms with them, that defines us. For a while I have been wondering how Savall's profuseness matched intellectual depth. My university tutor spent years studying Ramon Llull.